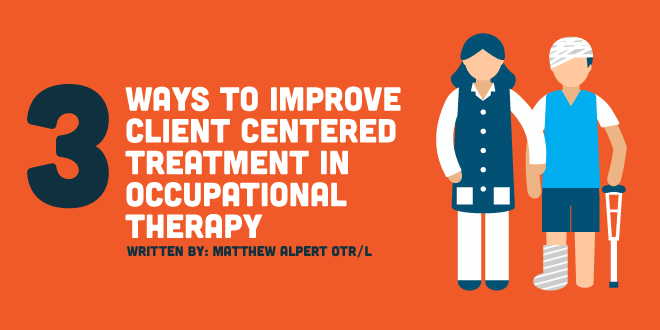 Client-centered treatment is the essence of occupational therapy. Our foundations of occupational therapy are focused on the patient's goals and barriers to improve their occupational performance. We as occupational therapists should never forget what's important to the patient. They should always be the main focus of our practice; however, sometimes we need to keep up with productivity of the clinic or our case load. Here are a three ways to improve your client-centered treatment. 1) It's the client's goals, not your goals! When developing the client's treatment plan, you should consider these essential questions with solely the patient in mind, not yourself, and not the clinic. Occupational therapy is a client-centered profession, which really separates us from other professions and makes us unique within the healthcare community. The essence of being client centered is highlighted in AOTA's Centennial Vision. 2) Is it a barrier or an asset in disguise? When we were students, we oftentimes focused more on barriers to success, rather than positive outcomes. Now as new graduate occupational therapists, our main focus should be on maximizing the functional performance of our client. Barriers to success should only help to provide us with a defined starting point, where we can utilize performance skills to achieve client goals. Occupational adaptation is a perfect example of this. When using this frame of reference, the client's barriers are minimized, and assets are maximized. The client is to use the most of their functional performance as possible, even if it's maladaptive and involves improper movements. This allows them to use the extent of their performance skills, and identifies what they can and cannot do. This allows us to develop our assessment of the client and develop our clinical reasoning, which is vital in determining what really is a true barrier or an asset. Whether you're a student on fieldwork, or an experienced occupational therapist, there is nothing wrong with saying "I just don't know." As new grads, we are experts at what we know, but it is important to also be aware of what we don't know. A senior therapist may have double if not triple the amount of clinical experience than a new graduate. Remember, the senior therapist was once a new grad as well, and knows where you are coming from and might also discover additional factors that were missed or overlooked. If you're a student on fieldwork, you are not expected to have all the answers. As an occupational therapy student, you should ask questions, but should be asking them with solutions or answers in mind.